August is the month of garden abundance. In the case of my garden this year, the abundance is mostly in weeds. While many of the vegetable seeds I planted in the hopeful days of spring have been a flop, however, others have grown into prolific production. 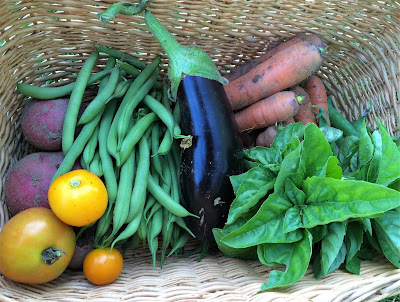 In the time-honored tradition of vegetable gardeners, I’ve been passing along the overabundance to friends and neighbors when I can – and gladly accepting other gardeners’ excesses. It’s all part of the gardening cycle. Each spring, I till the soil in my garden, add a bit of compost from the heap at the edge of the garden fence, throw in some manure, and create somewhat straight rows where I drop seeds with the optimism inspired by warm spring days. Then I wait, and weed, and watch for tiny sprouts to pop through the soil and reach for the sun. My gardening endeavors fall somewhere between necessity and hobby. Yes, I can simply run down to the grocery story to buy whatever doesn’t grow well – although store-bought veggies never taste as good as the ones picked from the backyard – and I don’t tend a garden big enough to keep us fed on pickled beets and frozen beans throughout the long winter. Still, this labor of love – and sweat and dirty fingernails and hope – occupies enough time and effort that I expect to have a few weeks at least where most of our veggies come from the garden, and longer on either end of that time when we can pick a few greens or some herbs or the odd carrot or two to add to the table. Every year, the garden yields differently. This year, the peas – so abundant the last two summers – fizzled in July’s stubborn, scorching heat. My beans, always a success, yielded only one incomplete row of sprouts, which soon dwindled to two producing plants – enough for a handful of beans here and there, but certainly not the bumper crop of past years that filled the freezer. My carrots have been slow to grow. The beets are scrawny. The jury is still out on the Brussels sprouts. My cucumber vines, though, have produced copiously. Each day for the last two or three weeks I have found three or four spiky cukes hidden beneath the sprawling leaves. If I miss a day or two of picking, I end up with a dozen cucumbers. Luckily, this is a vegetable my kids love (although I expect at this rate, they’ll tire of cucumbers soon). I’ve passed along the extras when I can, and I’ve been – happily – on the receiving end of others’ gardening glut. Our vacationing neighbors invited us to pilfer their tomato plants while they’re away. My mother has kept us in green beans. I sent a bag of cucumbers into the office with my husband and received fresh-picked ears of sweet corn in return. I shared a pile of cukes and a couple of summer squash with a friend whose garden had been devoured by deer, and she handed me a carton of eggs from her chickens. Beyond the cucumbers – and among the weeds – there are a few other garden successes. Although I missed National Sneak Some Zucchini Onto Your Neighbor’s Porch Day (August 8), it’s just as well, since the squash hill has yielded just the right number of zucchini – a near impossible feat. The sungold tomatoes have ripened in perfect handfuls. I’ve had good luck, for the first time ever, growing onions. The eggplants are suddenly bursting with lovely, sleek, deep purple fruit. The basil, which I thought had wilted beyond recovery in July, has bounced back full and green, and we had our first garden pesto of the season last week. All that fresh-picked color piled onto the kitchen counter makes the gardening effort feel worthwhile. And it ensures I’ll return to the backyard plot to till the soil again next year, to continue the gardening cycle – flops and abundances, weeds and all. Original content by Meghan McCarthy McPhaul, posted to her blog, Writings From a Full Life. This essay also appears as Meghan's Close to Home column in the August 23, 2018 issue of the Littleton Record.